All else being equal (power output, weather, wind resistance, etc. ), how much faster will I be if I lose 10kg (going from 100kg to 90kg) while riding? Acceleration and climbing might be much different, but while riding steadily on a flatish road outputting the same power as before, how will my cruising speed change ? According to BikeCalculator, assuming you drop 10 kg while everything else remains the same (power output, etc. ), you would travel 0.3 km/hr faster over a 50 km ride, on the average. In other words, at 100 kg, assuming an average power output of 150 Watts, you'd average 27.54 km/hr over a 50km ride if you weighed 100 kg; doing the same ride at the same 150 Watt average output, you'd average 27.84 km/hr if you weighed 90 kg. That's an increase of very slightly over 1% in speed. Having just gone from 100 kg to just under 90 kg over the past couple of months, however, I'd say that BikeCalculator understates the practical impact of losing that kind of weight. Since climbing, in particular, is basically all about the power to weight ratio, I have certainly noticed how climbing has gotten easier and how I can go faster up various climbs, and I intend to drop another 9-10 kg. For example, if you ride on a mix of terrain, both flat and climbing, you will gain more than 1% in average speed. 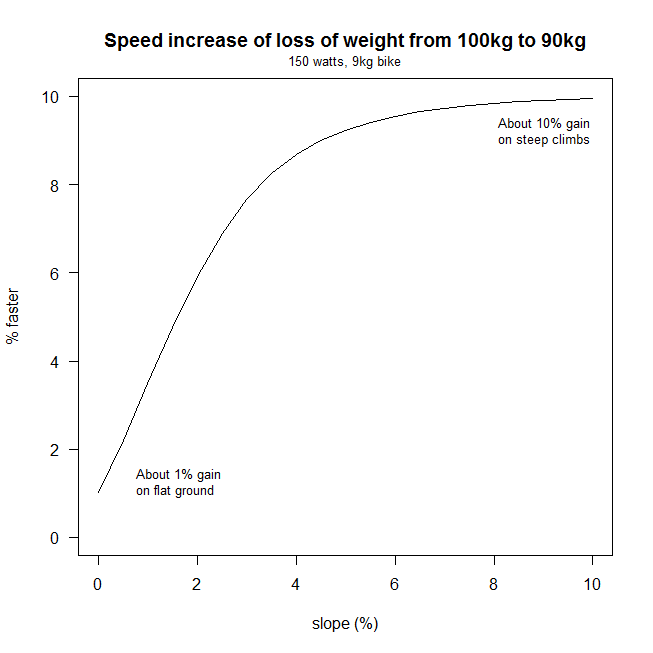 Assuming the same average power as above, here is how average speed will increase with a 10 kg weight loss for climbs of different slope. Best of luck dropping the weight and keeping it off. Saying you lose weight slows you down is really reaching. As a 100kg rider, a former weightlifter, I recognize my strength on the flats. Losing weight would make me slightly slower going downhill. It may be an advantage with a tailwind. But, big picture, these are ridiculously minute gains. As soon as I hit an 8% pitch, I'm in trouble as I try to maintain 4-5w/kg. I need to sustain 400-500w for 8 mins. Really? The 72kg guy is blasting upward at 290-350w. This is a human effort. I die, they leave me for dead, and after 2 minutes of watching them disappear, (knowing that if it were flat this wouldn't happen) you realize your day is over. So, yeah, there are some physics that imply weight advantage. Who cares. The loses are huge on hills. Ever try a crit? Brake into a corner, lose all your momentum, then the pencil/whippet beside you launches out of the corner and I blast too. I'm at 1000w. Over and over. 60 times a race? Who the heck can do that. Lose weight! If it were a big man's sport, there would be big people in it. There aren't. Don't tell me about big people in cycling. I'm 6'3 and 220lbs. When I stand next to someone who is 175, they look like a stalk of asparagus. Like bamboo. Not big. At 6'4 and 180, that is very lean. Riders are at an advantage being smaller. Relative power. If you lost 22lbs or 10kg, you would hardly notice the difference on the flats. You probably just lost fat. What they say about muscle is for people who are digging deep. Big gut people just get way faster. Pick up 22lbs. And imagine going up a steep grade without it! You will breathe better, jump out of the saddle and dance compared to what you are used to. I said to a friend, if I stopped riding this winter, and re-emerged in spring, not having ridden one mile, but weighing 22lbs less (10kg) I would be faster than last season within one month or less. By comparison, how many people boost their FTP by more than 5%. 300-315. Pretty good. 300-330? No way. And if it was achieved, in year two, 330-360? Then 390? Don't believe it. By losing weight, and 10% of your weight, and adding strength with some hard training, you will way out perform what you can do in training. Losing weight, especially fat, is key to success. Remember, this isn't a bench press competition. It's a chin up contest. The big muscle big gut guy lifts huge weights and weighs an enormous amount. The skinny guy with the skinny legs and bony ribs and little skull with skinny wrists is no challenge. But wait: he only weights 120 lbs. So he can rip off the chin ups. Compare this: skinny guy adds fat to his gut but all else is the same-more or fewer chin ups? Meanwhile muscle guy with the gut lifts even bigger dumbbells and now his arms are even bigger. Same gut. Does he win now? The point is, you don't know exactly how much faster, but it is an absolute fact-you get leaner you just got faster. Why is cycling on a road so much faster than cycling on a cycle path? How much slower are big tires? How much better are aerodynamics between a vintage road bike and a top of the line aerobike?